Did anyone ever watch a film called Stargate? It was released in 1995 in Australia and the spin-off television series aired in 1997 – to continue for ten seasons. I used to watch it occasionally but it wasn’t a staple of my television diet even though I’m a sci-fi fan. Mind you every time I saw one of the main characters – Richard Dean Anderson (Jack O’Neill) – I’d think of MacGyver. 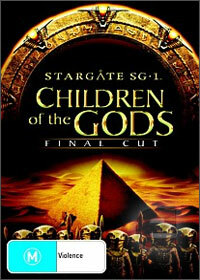 The pilot of the spin-off tv series Stargate: Children of the Gods has recently been digitally remastered for DVD release and features updated scenes, music, visual effects and special features. I was sent a copy to have a look at and I’ve got a spare one to giveaway also (details below). Back to the movie quickly. I’d have liked to watch the movie again before I wrote this but haven’t had the chance. Does anyone remember the twist at the end? I’ve searched and haven’t been able to find details. I vaguely remember but don’t want to say incase I’m wrong though so if anyone does remember please leave a comment and let me know. I watched the DVD the other night and like I said I think of MacGyver series when I see Anderson and I knew everything would be okay when his superiors were suggesting to put a probe through the Stargate to find out what was there but he sent a box of tissues through because their colleague who’d been left behind had allergies and he’d therefore understand where the tissues came from. The scenes I couldn’t look at involved things coming out of stomachs but that aside once the DVD finished I was keen to see more. I’d been expecting a one hour pilot but this was movie length and felt like watching a movie rather than a TV show. To win a copy of this DVD please leave a comment and tell me why you like watching sci-fi. This is only open to Australian residents and you’ve got until midnight Saturday 3 October 2009. Update: competition now closed. Winner is Farmers Wife with the, ““does life on other planets really exist”? Well according to Lost in Space, it does! From green skined girls to magic mirrors, it all happens!”. I used to be a huge Lost in Space fan. Did you know that Dr Smith wasn’t even in the pilot episode? Farmers Wife, please contact me with an address to send your Stargate DVD to. Thanks, and enjoy. I like sci fi because it takes me out of this world.I remember Stargate. It always has me on the dge of my seat. I still cannot imagine how stars are light years away and how planets just hang out …the mind boggles. Though some of the stuff we have/see nowadays would have been sci fi to our grandparents generation. SCi fi is so much better than the extreme violence and smash & crash culture. I love sci fi because imagination can be used so much because people really don’t know what is out there. I am fascinated with astronomy and the big question “does life on other planets really exist”? Well according to Lost in Space, it does! From green skined girls to magic mirrors, it all happens! I love the way the universe looks, the planets, the silence, and the way it is portrayed in cinema. The ideas are endless really. I love sci-fi films because they help me ‘escape’ as I get sucked in to the storyline and space scenery. My husband and children are fans too, and this makes for excellent family bonding time when we all sit around the TV together to watch the movie or show. I love how creators think up new alien forms – we’ve migrated a long way since ET!